I personally enjoy bike commuting to work. My bike route is 12 miles round trip. Usually, I ride during the winter months, but recently, I just couldn’t muster up the energy. Last week I jumped on my bike for the first time in a long time and rode to work. I was out of shape. Here are some tips to help you get ready for your first ride of the season. 1. Visit the gym. If you exercise on a regular basis, consider adding some spinning to your routine before riding. I’ve done light weights and the elliptical machine all winter because I don’t enjoy peddling in place. Unfortunately, by not changing my workout routine, I wasn’t in shape for my first ride. 2. Visit your local bike store. If you do a significant amount of riding each year, consider taking your bike in for a tune-up. Proper maintenance is key to a safe and enjoyable biking season. Here are a few things you should do before each ride. Check your tire pressure with a tire gauge. Keeping your tires at the proper pressure keeps your bike rolling more efficiently. Quickly check your tire bead for debris that may be embedded in the tire. Give your wheels a spin to make sure there’s no wobble. Make sure the brakes grab appropriately. In addition, if your bike doesn’t feel comfortable, it may need an adjustment or some new items, such as a new seat or hand grips. 3. Think about what gear to wear. This time of year, the temperature is tricky. If you ride to work, you know the temperature in the morning is different than the temperature during the evening commute home. If you’re a weekend rider, you may not be as aware of what you need to stay comfortable. Your best bet is to wear waterproof and water-wicking layers that can be easily taken off as the temperature changes during your ride. 4. Watch out for potholes. After a brutal winter, potholes can be found in new places. Hitting one could send you flying. Recently, my friend’s brother made a trip to the emergency room after hitting one. In addition, there’s a lot of debris on the side of the road to watch out for. 5. Ride on the bike path. If your community has a bike path, consider riding there to start. It’s a nice way to reacclimate your mind and body. Also, since the temperatures are still cool, motorists may not be on the lookout for you. 7. Give it a good wash. If you didn’t wash your bike after last season’s riding, do it now. This is a good opportunity to wash away winter salt, dirt, sand, and other road debris. Never use a high-pressure sprayer. A garden hose will suffice. Don’t forget to lubricate your chain afterwards. If you don’t enjoy biking as a hobby that’s okay. As a motorist, here are some laws you should understand. Safe passing laws – This law requires a motor vehicle to allow no less than three feet of clearance when passing a bicyclist. Treatment as a vehicle – Bicyclists have the same rights and duties of a driver of a vehicle. Where to ride – If riding in the street, bicyclists need to ride as close to the curb or edge of the roadway as possible. Keep in mind bicyclists are probably still two to three feet away from either. So, while it can be frustrating to approach bikers in the road and be forced to slow down, the bikers have the right to be there. Respect their space and pass when it’s safe to do so. Dooring law – I’ll bet you’ve experienced this while driving your car, a door from a parked car suddenly opens just as you’re approaching the car. This situation can be even more dangerous for bikers. The dooring law states that a person in a parked car doesn’t have the right to open the door at any time. A driver or passenger may only open a door when it’s reasonably safe and doesn’t interfere with the movement of traffic. 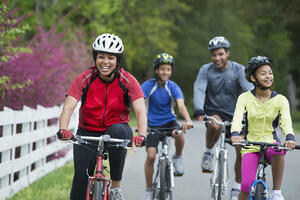 For additional bicycling safety tips, check out my blog “Bike safety tips for commuters, families, and enthusiasts”.